We’ve started a new project aimed at improving the default Magento 2 import / export functionality. Although this process is significantly refined now, it still lacks some important features; therefore we are working on this Magento 2 extension. We have an aim to build a multi purpose solution. 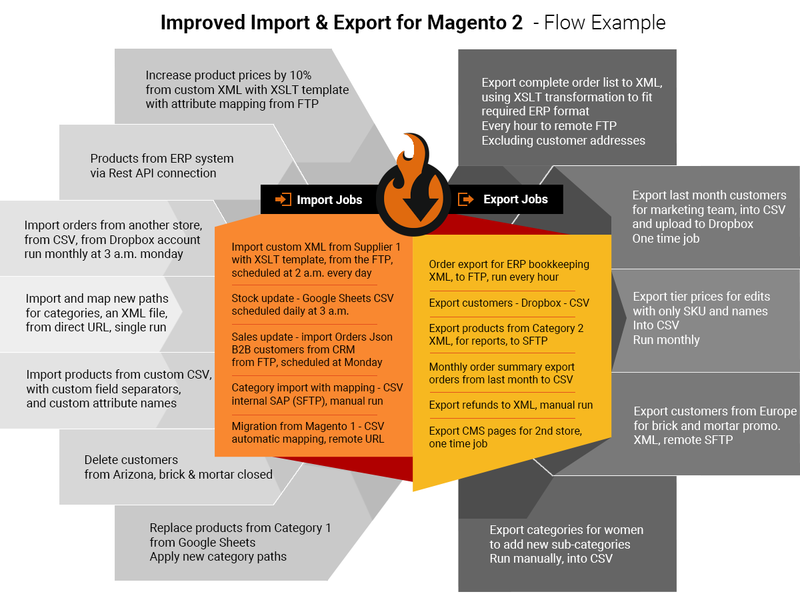 Improved Import extension for Magento 2 provides a possibility to import your CSV, XML, Json, XLSX, ODS files with products data and product images to Magento 2 from a remote FTP server, Dropbox, Google Sheets, a direct URL of a source file, supports dedicated categories import, Rest and Soap APIs, on fly import of product attribute values, import/export cron jobs and more! For further information, check this Improved Import / Export changelog. Scheduled cron job configuration provides automated product updates from a cloud storage where the updated information appears from 3th party tools, warehouses, Product Inventory Management (PIM) systems, etc. Thus, the module could be very useful for regular automatic product stock status updates as well as other product attribute updates in Magento 2. Especially with introduction of Rest and Soap APIs support. Scheduled import via the cron job is a feature available in Magento 2 Enterprise Edition out of the box, but with this module (our module) and you can get it in Magento 2 Community Edition along with other import features, such as category import or product attribute values import on the fly – both works great. 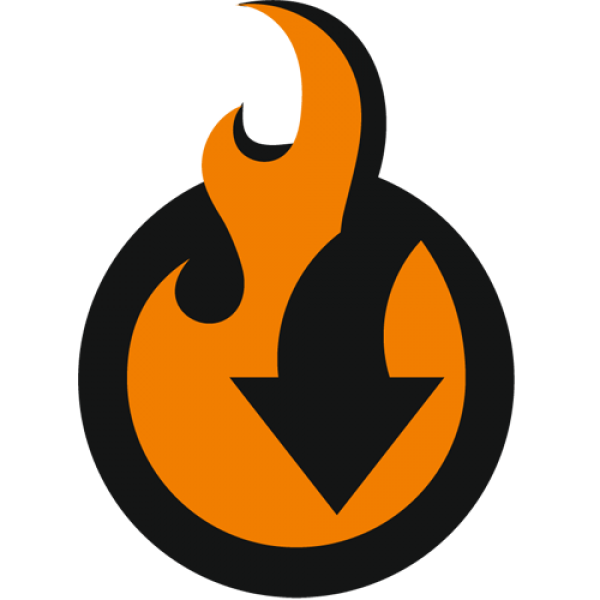 Please note that the extension is available in two versions – a lite free open source version is available on GitHub and allows you to import source CSV files as well as product images from a remote FTP server and Dropbox. A paid full version supports more import sources including Google Sheets and adds some additional features, such as a scheduled cron job for CSV, XML, XLSX, ODS, Json file import and a file and product images export to Google Drive, Dropbox, via FTP/SFTP, or other sources. Besides, it offers free support and regular upgrades with new features! New features of both extension versions are available under System / Import. Supports CSV, XML, XLS and XLSX, ODS, Json file formats. New import and export entities to complement native Magento 2 import, including: orders, categories, CMS pages, cart price rules, product attributes. Magento 2 import Rest and Soap API support for third party accounting software integration. XLST transformation templates to import XML files of any structure. Write to us, if you require custom XLST composed. Migration presets for Shopify and Magento 1 – you can migrate product catalogs from all these three platforms to your Magento 2 with automatically mapped attributes. Product price updates during import – import jobs allow you to increase and decrease prices of the imported products by flat or percent value. Support of all product types – configurable, bundle and grouped products can be imported with assigned variations. Dedicated categories import – by default Magento 2 only allows to import categories during product import, but with our extension you can easily import a dedicated .csv file with categories. Categories can be imported by name, parent id, or full path with category structure. Attribute EAV import and export – get full list of attributes and attribute sets, or create new attributes and sets as you import them. On the fly product attribute values import. If values for attributes on your CSV file do not exist in Magento – they will be created on the fly during the product import procedure. Create new attributes on the fly – type in attribute name and other settings into the column just like per the extension manual. Full support of import configurable products – we have added custom logic for creating configurable products to ease the configurable product creation process. Read full guide to configurable product import. There are also appropriate CLI commands aimed at Import. They are integrated into the native Magento 2 CLI interface and simplify the control over the import process and import cron jobs. Product info and stock sync with external CRM / ERP / PIM or any other system – it is only necessary to setup CSV, XML, Excel or OpenOffice file data and create Cron job import in Magento 2 admin. You can also connect using Rest and Soap APIs with Json files. Full circle Magento 2 and Dropbox integration – streamline the world’s most popular cloud storage and file collaboration tool in your Magento 2 routine! Import and export products, categories, and customers to Dropbox and get a new level of team collaboration: by sharing import and export folders on Dropbox, you will simplify Magento inventory management and make it as affordable as never before. In a combination with import cron jobs, you can edit your import file on your Dropbox folder and get all data updated in a Magento 2 database in minutes! With Improved Import and Export for Magento 2 you can import products and other Magento 2 entities directly from the Google Sheets. Thus you can cooperate with your supplier and colleagues on a single sheet. Specify to the Sheet you are working with (we support multiple sheets, just select the correct one and copy the link) and you are good to go. We have a fully-featured Google Sheet guide you can always refer to if you are experiencing any issues. We have also composed a Google Sheet Master Table where we have gathered all Magento 2 entities that can be imported: products, categories, orders, cart price rules, advanced pricing, all customer files, CMS blocks and pages. The Master Table is your quick-start buddy to Magento 2 import. Every attribute comes with the clues that explain what a particular attribute does and which values are expected from you in the dedicated entity cell. Flexible category manipulations are allowed. Product attribute values which is do not exist in your Magento 2 database will be automatically created on the basis of info from a product import file. Default Magento 2 requires creating product attributes manually before importing products with them. This feature can save tons of time on large amount of products with different attribute values to Magento 2. When importing attributes, the extension allows creating attribute sets automatically. If the attribute from the table you are importing belongs to the new attribute set – it will be automatically created based of the default attribute set. 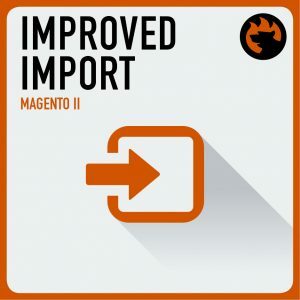 The idea behind the import of product attributes to Magento 2 on the fly during the product import is pretty simple and common – instead of having only attribute name on a column with attributes we add all data required for attribute creation there. For instance, attribute set, frontend labels, scopes, etc. You can find a structure sample and a sample CSV file below. Please follow the examples carefully and import file with products first. If it works correctly, you can create a custom attribute column and add new attributes. This will reduce possible problem, debug time, and time necessary to fix issues. sku,name,url_key,store_view_code,attribute_set_code,product_type,color,size,"attribute|frontend_input:select|is_required:0|is_global:1|default_value_text:test text|is_unique:0|frontend_class:validate-alphanum|is_used_in_grid:1|is_filterable_in_grid:1|is_searchable:1|search_weight:3|is_visible_in_advanced_search:0|is_comparable:0|is_filterable:1|is_filterable_in_search:1|position:2|is_used_for_promo_rules:0|is_html_allowed_on_front:1|is_visible_on_front:1|used_in_product_listing:0|used_for_sort_by:1|frontend_label_0:New Brand 1|frontend_label_1:New Brand English|attribute_set:Default,Accessories",categories,product_websites,description,short_description,weight,tax_class_name,visibility,price,meta_title,meta_keywords,meta_description,base_image,base_image_label,small_image,small_image_label,thumbnail_image,thumbnail_image_label,created_at,updated_at,new_from_date,new_to_date,display_product_options_in,additional_attributes,qty,out_of_stock_qty,use_config_min_qty,is_qty_decimal,allow_backorders,use_config_backorders,min_cart_qty,use_config_min_sale_qty,max_cart_qty,use_config_max_sale_qty,is_in_stock,notify_on_stock_below,use_config_notify_stock_qty,manage_stock,use_config_manage_stock,use_config_qty_increments,qty_increments,use_config_enable_qty_inc,enable_qty_increments,is_decimal_divided,website_id,related_skus,crosssell_skus,upsell_skus,additional_images,additional_image_labels,custom_options 24-WG085_10,Sprite Yoga Strap 6 foot 10,sprite-yoga-strap-6-foot-10,,Default,simple,Black,S,Ray-Ban,"Default Category/Gear,Default Category/Gear/Fitness Equipment,Default Category/Yoga/Style",base,"<p>The Sprite Yoga Strap is your untiring partner in demanding stretches, holds and alignment routines. The straps 100% organic cotton fabric is woven tightly to form a soft, textured yet non-slip surface. The plastic clasp buckle is easily adjustable, lightweight and durable under strain.</p><ul><li>100% soft and durable cotton.<li>Plastic cinch buckle is easy to use.<li>Three natural colors made from phthalate and heavy metal free dyes.</ul>","asd",1,Taxable Goods,"Catalog, Search",14,Meta Title,"meta1, meta2, meta3",meta description,,,,,,,01.07.2015 15:38,01.07.2015 15:38,,,Block after Info Column,"has_options=0,required_options=0,size_strap=6 foot",100,0,1,0,0,1,1,1,0,1,1,,1,0,1,1,0,1,0,0,1,,,,,,"name=Custom Yoga Option,type=drop_down,required=0,price=10.0000,price_type=fixed,sku=,option_title=Gold|name=Custom Yoga Option,type=drop_down,required=0,price=10.0000,price_type=fixed,sku=,option_title=Silver|name=Custom Yoga Option,type=drop_down,required=0,price=10.0000,price_type=fixed,sku=yoga3sku,option_title=Platinum" 24-WG085_11,Sprite Yoga Strap 6 foot 11,sprite-yoga-strap-6-foot-11,,Accessories,simple,Yellow,S,Dior,"Default Category/Gear,Default Category/Gear/Fitness Equipment,Default Category/Yoga/Style",base,"<p>The Sprite Yoga Strap is your untiring partner in demanding stretches, holds and alignment routines. The straps 100% organic cotton fabric is woven tightly to form a soft, textured yet non-slip surface. The plastic clasp buckle is easily adjustable, lightweight and durable under strain.</p><ul><li>100% soft and durable cotton.<li>Plastic cinch buckle is easy to use.<li>Three natural colors made from phthalate and heavy metal free dyes.</ul>","asd",1,Taxable Goods,"Catalog, Search",14,Meta Title,"meta1, meta2, meta3",meta description,,,,,,,01.07.2015 15:38,01.07.2015 15:38,,,Block after Info Column,"has_options=0,required_options=0,size_strap=6 foot",100,0,1,0,0,1,1,1,0,1,1,,1,0,1,1,0,1,0,0,1,,,,,,"name=Custom Yoga Option,type=drop_down,required=0,price=10.0000,price_type=fixed,sku=,option_title=Gold|name=Custom Yoga Option,type=drop_down,required=0,price=10.0000,price_type=fixed,sku=,option_title=Silver|name=Custom Yoga Option,type=drop_down,required=0,price=10.0000,price_type=fixed,sku=yoga3sku,option_title=Platinum"
24-WG085_10,Sprite Yoga Strap 6 foot 10,sprite-yoga-strap-6-foot-10,,Default,simple,Black,S,Ray-Ban,"Default Category/Gear,Default Category/Gear/Fitness Equipment,Default Category/Yoga/Style",base,"<p>The Sprite Yoga Strap is your untiring partner in demanding stretches, holds and alignment routines. The straps 100% organic cotton fabric is woven tightly to form a soft, textured yet non-slip surface. The plastic clasp buckle is easily adjustable, lightweight and durable under strain.</p><ul><li>100% soft and durable cotton.<li>Plastic cinch buckle is easy to use.<li>Three natural colors made from phthalate and heavy metal free dyes.</ul>","asd",1,Taxable Goods,"Catalog, Search",14,Meta Title,"meta1, meta2, meta3",meta description,,,,,,,01.07.2015 15:38,01.07.2015 15:38,,,Block after Info Column,"has_options=0,required_options=0,size_strap=6 foot",100,0,1,0,0,1,1,1,0,1,1,,1,0,1,1,0,1,0,0,1,,,,,,"name=Custom Yoga Option,type=drop_down,required=0,price=10.0000,price_type=fixed,sku=,option_title=Gold|name=Custom Yoga Option,type=drop_down,required=0,price=10.0000,price_type=fixed,sku=,option_title=Silver|name=Custom Yoga Option,type=drop_down,required=0,price=10.0000,price_type=fixed,sku=yoga3sku,option_title=Platinum"
24-WG085_11,Sprite Yoga Strap 6 foot 11,sprite-yoga-strap-6-foot-11,,Accessories,simple,Yellow,S,Dior,"Default Category/Gear,Default Category/Gear/Fitness Equipment,Default Category/Yoga/Style",base,"<p>The Sprite Yoga Strap is your untiring partner in demanding stretches, holds and alignment routines. The straps 100% organic cotton fabric is woven tightly to form a soft, textured yet non-slip surface. The plastic clasp buckle is easily adjustable, lightweight and durable under strain.</p><ul><li>100% soft and durable cotton.<li>Plastic cinch buckle is easy to use.<li>Three natural colors made from phthalate and heavy metal free dyes.</ul>","asd",1,Taxable Goods,"Catalog, Search",14,Meta Title,"meta1, meta2, meta3",meta description,,,,,,,01.07.2015 15:38,01.07.2015 15:38,,,Block after Info Column,"has_options=0,required_options=0,size_strap=6 foot",100,0,1,0,0,1,1,1,0,1,1,,1,0,1,1,0,1,0,0,1,,,,,,"name=Custom Yoga Option,type=drop_down,required=0,price=10.0000,price_type=fixed,sku=,option_title=Gold|name=Custom Yoga Option,type=drop_down,required=0,price=10.0000,price_type=fixed,sku=,option_title=Silver|name=Custom Yoga Option,type=drop_down,required=0,price=10.0000,price_type=fixed,sku=yoga3sku,option_title=Platinum"
A full guide to importing Magento 2 downloadable products and how they work can be found here. The powerful mapping feature allows you to map Magento attributes to custom columns in your CSV file. The attributes are mapped at the import job settings. Once you select the entity and upload and verify the file, the Map Attributes section becomes available. In the left column there is a dropdown with all Magento attributes to select. In the right column – a dropdown with column names from your import file. Once you have finished with mapping – Save Job and run it from the command line to test and then schedule cron import. With the import fields mapping feature you can import custom-formatted files from various e-commerce systems, PIM, ERP, SAP. We have presets for Shopify, Magento 1 already available. In the upcoming releases new e-commerce platforms will be supported. 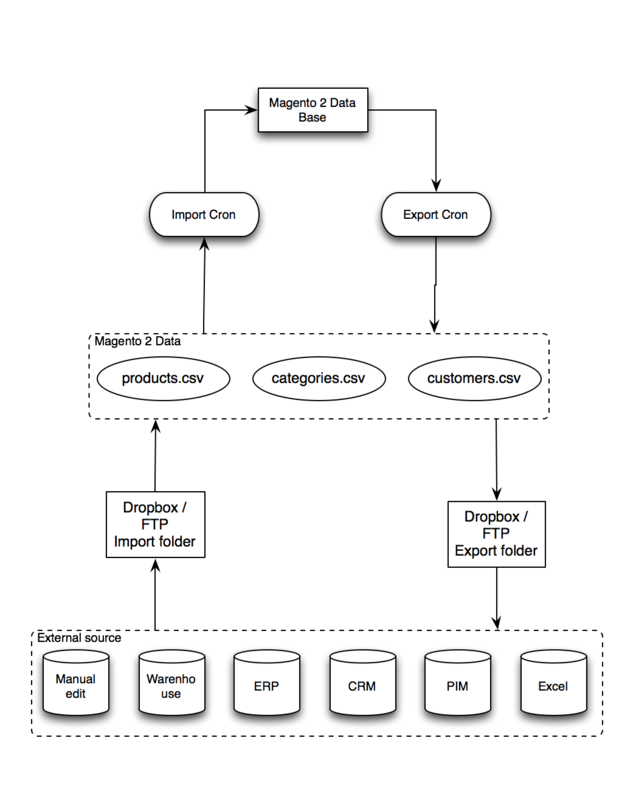 But now, you can already map any custom data structure to Magento product attributes for import. You can vote for the upcoming Import and Export Magento 2 extension features at the dedicated roadmap page. After purchasing the extension, you will receive free upgrades during six months and also will get 30% discount for 1 year support period renewal! It means that you can purchase the module now to use current features and get free updates with powerful new features! For further information, consultation, or to request individual new features use our contact form! We provide professional installation services for our Magento 2 extensions – get your extension work right after the purchase!